Tantalize your taste buds with this smoky fermented hot sauce recipe. This easy homemade hot sauce will be a table staple and makes for a creative food gift! 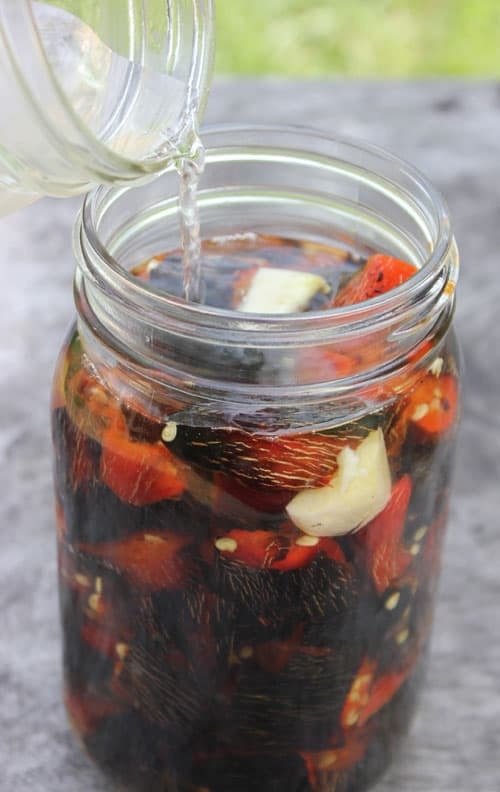 One of our favorite ways to preserve hot peppers is to turn them into a lacto-fermented hot sauce. This condiment graces our table every night, and while I’m not the type to add hot sauce to my pasta and meatballs like my husband Brian, I appreciate a bit of spicy tang on my pork tacos and egg burritos! This year we decided to shake up our usual homemade hot sauce recipe and fire-roast the jalapeños before fermenting for a bit of smoky flavor. The results: Ah-mazing! 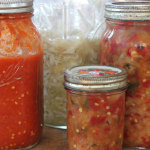 Here is our fermented hot sauce recipe to make and to share! Making fermented hot sauce at home is quite easy – it’s a great beginner’s ferment because it’s really hard to get it wrong. The first step of this fermented hot sauce recipe is to source really fresh and delicious hot peppers. We have found that ripe, red jalapeños (I like growing these for an early harvest) work better than cayenne (the seed to flesh ratio of cayennes is too high and you end up with a hot sauce that is slightly bitter because of the seeds), but another hot pepper of your choice will work! Next, prepare a fire for roasting. 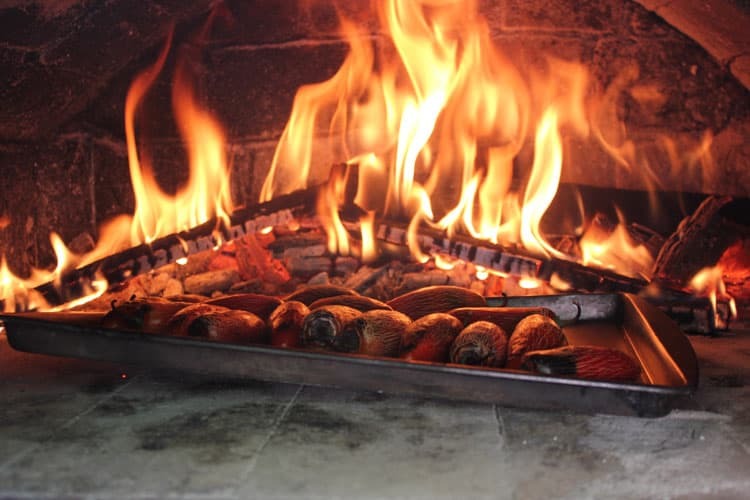 We used our outdoor pizza oven and a live fire to roast the peppers, but you could also do this on a grill or over an open fire. Roast the peppers until blackened and peeling. Next, remove the stems of the peppers, and if desired, chop into 2-3 pieces. At this point, you could also remove some of the seeds to reduce spiciness (and a bit of bitter flavor), but it’s not necessary. The lacto-fermentation process uses a salt brine to encourage the development of desired bacteria (Lactobacillus, predominantly) that convert lactose and other sugars into lactic-acid, a natural food preservative. The salt brine is the same one used to make naturally fermented pickles or radishes. Because we use our salt brine frequently, I like to batch a gallon batch and keep it at the ready. To make one gallon of brine, simply dissolve 3/4 cup of salt in one gallon of water. 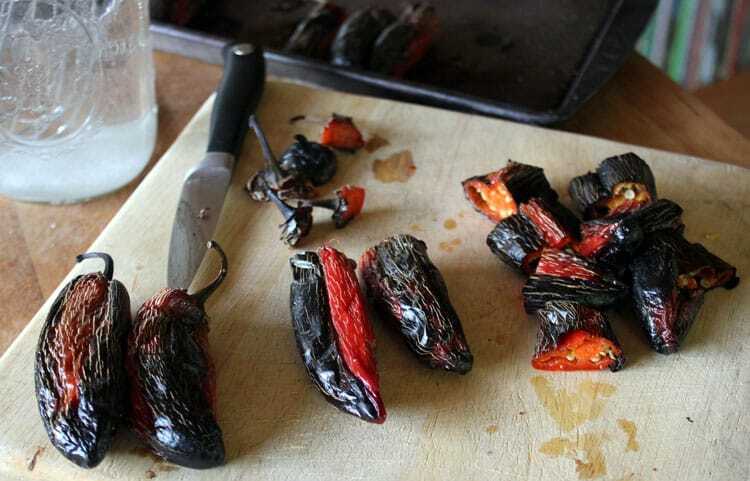 5) Ferment Your Fire-Roasted Peppers! Place your fire-roasted jalapeños in a wide-mouthed mason jar (we used a quart sized jar) and cover the peppers completely with your salt brine. At this point, some home fermenters choose to use a glass weight like this one to keep the peppers under the level of the salt brine. You could also use a clean rock. We also chose to add some whole garlic cloves to the ferment at this point, just for a bit of extra flavor. 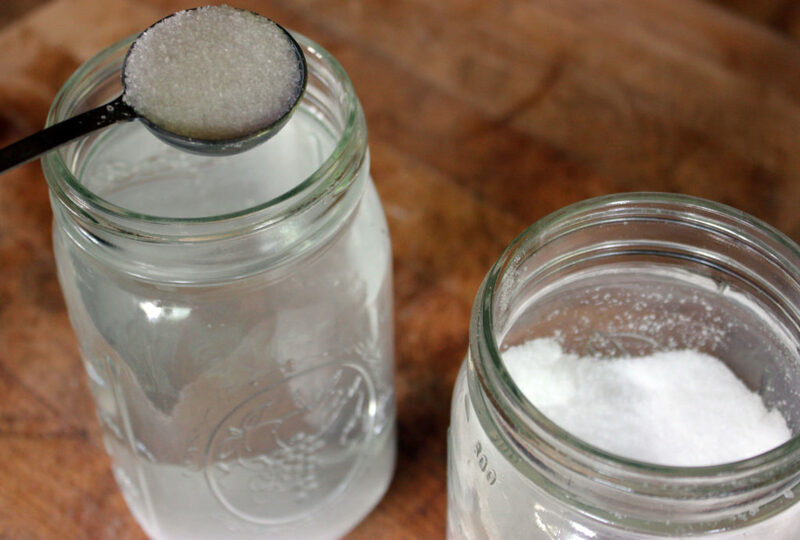 Place your mason jar on a kitchen counter where you can keep an eye on your ferment. Every day or so, check to make sure your peppers are still under the level of the salt brine to prevent mold growth. If they are not, you may need to push them back under the brine, or adjust your weight. 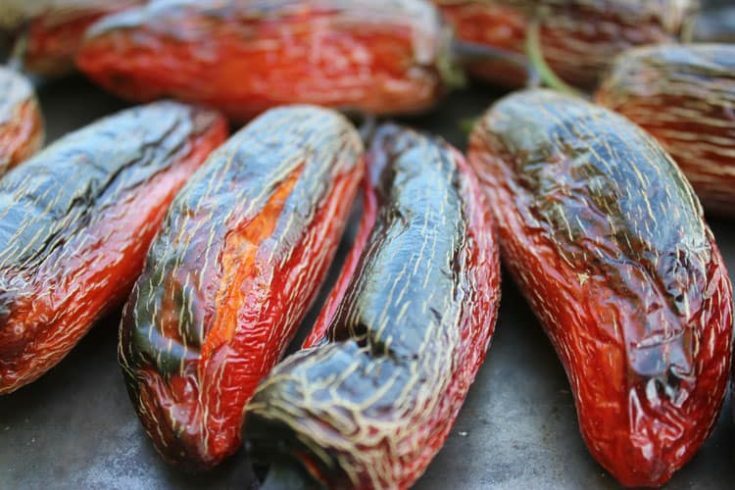 Allow your fire-roasted jalapeños to ferment for a week or two. You will begin to see small bubbles forming – this is a good thing!. You can also taste a pepper and see if it has developed a nice tangy flavor. We have kept this batch of lacto-fermented hot sauce fermenting on our kitchen counter for several weeks. At this point, you can either move the entire jar into cold storage (a root cellar, basement, or fridge works well), or you can blend your peppers into a liquid hot sauce. We tend to make this fermented hot sauce recipe a lot, so we move the jar of fermented peppers into cold storage in our root cellar, blending new batches of sauce as we need them. Once you have blended your fire-roasted fermented hot sauce, you can keep a small jar of your homemade hot sauce on the table for easy use, and store the rest in your refrigerator. 8) Share the Recipe with your Friends! 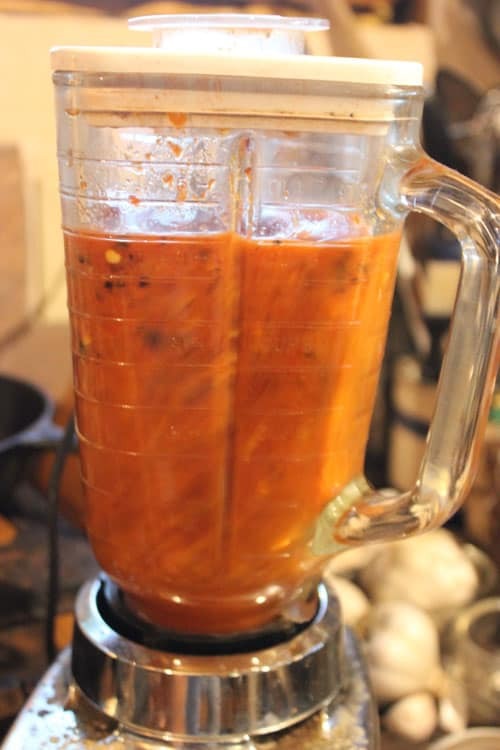 I guarantee that your friends and family are going to want this fermented hot sauce recipe, so go ahead and bookmark this page now, for easy reference! Your homemade fire-roasted hot sauce will also make a fabulous holiday gift, so you may want to source some small glass jars for sharing! 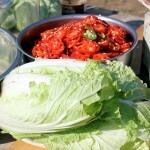 Did you make this fermented hot sauce recipe? How did you like the flavor? I’d love to hear from you, so please leave a comment below! Tantalize your taste buds with this smoky fermented hot sauce recipe. 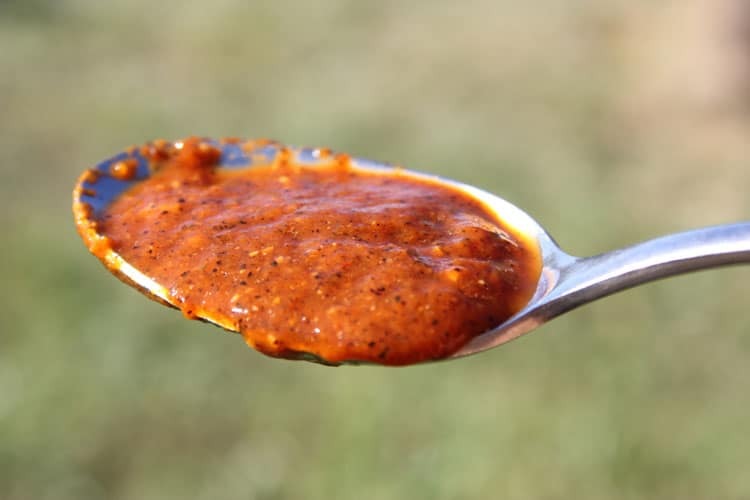 This lacto-fermented fire-roasted pepper hot sauce will be a table staple! The first step is to source really fresh and delicious hot peppers. We have found that ripe, red jalapeños work better than cayenne (the seed to flesh ratio of cayennes is too high and you end up with a hot sauce that is slightly bitter because of the seeds), but another hot pepper of your choice will work! Remove the stems of the peppers, and if desired, chop into 2-3 pieces. At this point, you could also remove some of the seeds to reduce spiciness (and a bit of bitter flavor), but it’s not necessary. Prepare a salt brine for the fermentation process. 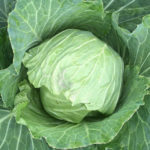 The lacto-fermentation process uses a salt brine to encourage the development of desired bacteria (Lactobacillus, predominantly) that convert lactose and other sugars into lactic-acid, a natural food preservative. Place your fire-roasted jalapeños in a wide-mouthed mason jar (we used a quart sized jar) and cover the peppers completely with your salt brine. At this point, some home fermenters choose to use a glass weight like this one to keep the peppers under the level of the salt brine. You could also use a clean rock. We also chose to add some whole garlic cloves to the ferment at this point, just for a bit of extra flavor. At this point, you can either move the entire jar into cold storage (a root cellar, basement, or fridge works well), or you can blend your peppers into a liquid hot sauce. We tend to make a LOT of lacto-fermented hot sauce, so we move the jar of fermented peppers into cold storage in our root cellar, blending new batches of sauce as we need them. Once you have blended your fire-roasted fermented hot sauce, you can keep a small jar on the table for easy use, and store the rest in your refrigerator. You blend just the peppers and not the brine, right? Thanks! We add just enough brine to make the blending smooth. You could drain all the brine and have a thicker sauce, or add some of the brine and have a more liquidy sauce. I brew beer and wine all the time but I never thought to ferment peppers for a sauce! I can’t wait to try this recipe! I hope you like it Emma! It really is the most delicious hot sauce we’ve made, and we make a lot!! Let me know how it goes for you! I have a ton of red jalapeno’s on my plants. I am going to harvest them today and try this. One question, Is it o.k. to put the peppers in a jar with lid and store them without sealing them? Sorry for the silly question, I remember my mom canning when I was a kid and I remember she used a pressure cooker to seal the jars. Can I just put these in a jar and store them? Hi Mike, Not a silly question at all, but a pretty important one. 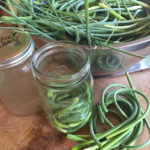 So, this recipe is for a fermented hot sauce, which means that it contains live cultures and probiotics that are good for your gut health, and would be destroyed in the canning process. If you follow my recipe, you will want to store the hot sauce in the fridge or in cold storage, like a root cellar. 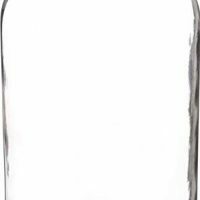 You can not follow the recipe as is and seal the jar and store it on a shelf – it will mold. 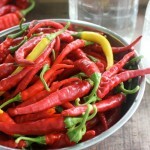 You could certainly find a different hot sauce recipe, which would include vinegar or lemon juice to make the ph lower. Then you would be able to process the hot sauce in a pressure canner or water bath canner. Thanks so much. I was hoping that sealing would NOT be necessary. How long would this recipe last if refrigerated? We still have some of our hot sauce from last year!! It lasts a long time. One tip is to add a splash of apple cider vinegar to a batch if you know you’ll be storing it for a long time. Let me know how you like it! Thank you for sharing this! I’ve wanted to make my own hot sauce for a while now. How long does this keep in the fridge? We still have some from last summer in our root cellar! We usually keep the fermented peppers whole until we are ready to blend them into hot sauce. Then you can mix up small batches. We are flying through this sauce – using 6 oz every week or two because it’s so tasty! !